A $5-million multi-use trail project on the east side of Red Deer ran into a bit of a snag this year, but it wasn't for lack of trying. The project, which includes a unique "living wall" and is about half done along the future 20th Avenue, could have been completed this year however a wet and stormy summer slowed progress. "It has been a very challenging year in terms of the weather," said Wayne Gustafson, Engineering Services manager for the City of Red Deer. But the good news is that the trail that was completed this year -- from 55th (Hwy 11) to 32nd Streets -- has been well received. People are already walking and cycling along the freshly laid three-metre wide asphalt trail. Gustafson said the project will continue next year with the remainder of the trail loop and berm being built from 32nd to 19th Streets (along 20th Avenue), and then west to Vermont Avenue in Vanier Woods. A tender has been issued for the work next season, and includes planting 520 trees and 680 shrubs along the trail that features the living wall. The wall, which Gustafson called a pilot project, is comprised of large earth-filled bags. Grass and other plants will grow into the wall that doesn't require regular maintenance such as cutting and trimming. The wall is now topped with a wire mesh fence so that people who might walk along the top of it won't fall off. Based on a sound study looking at noise abatement, the height of the wall and berm is designed to be 2.4 metres (eight feet) above the future 20th Avenue road surface. It's the first time the city has built a living wall system but it has been used successfully elsewhere in Alberta. It doesn't take as much land, and natural vegetation grows in it to help stabilize it. "So we're quite excited to see how that works," Gustafson said. A lengthy row of older trees along the trail route was removed last year. The new trees and shrubs will be planted in the spring, well ahead of when construction starts on 20 Avenue, which is sometime in the future, depending on need and funding. The landscaping will help alleviate some of the construction disturbance that will eventually occur, Gustafson said. When your passion is trail building, long journeys and obstacles don't deter you. In that spirit Central Alberta Regional Trails Society members accepted the bad news that a proposed 15-km trail in Lacombe County would not happen this year -- and likely not for some time. "We've had two major setbacks this year in terms of rural trail development," said Paul Pettypiece, society president. A Red Deer-to-Springbrook link through Red Deer County was also stopped in its tracks. But trail supporters' ultimate goal of creating a trail link at least between Innisfail and Ponoka remains, said Pettypiece. "It's just going to take a little longer than we had hoped that's all." In Lacombe County, landowner opposition to the trail could not be overcome. With a handful of property owners unwilling to part with a strip of land for trail use, and alternative routes extremely costly, county council voted to drop the project. It meant giving up $695,000 in grants that had been lined up. In July, an 11-km link between Springbrook and Red Deer was turned down. Red Deer County council voted against the project because of concerns that public support was unclear and necessary firm commitments from donors had not materialized. That trail was expected to cost $2.2 million to $3 million with up to $1.5 million of that covered by the Trans Canada Trail Foundation if the link could be in use by the fall of 2017 -- in time for Canada's 150th anniversary celebrations. Pettypiece said the trails group will continue to push for more trails and to spread the message of their benefits. In Lacombe County, the impact of a nearby trail on privacy was a concern of landowners. Vandalism, littering, loose pets harassing livestock and increased crime have also been cited as negatives. "It's going to take some time and it's going to take some efforts to get out and try to overcome some of these fears that people have," he said. Experience in other areas where trails have been built shows that most landowner concerns did not materialize. "Most of the fears that people have had are fairly common before trails are built," he said. "Then they discover that once trails are built very rarely do these things happen." Most trail users are responsible and are watchful for those not respecting the routes. "Organized trails, especially when there are good connections and there's a reasonable amount of usage, tend to be self-policing. People who are trouble-makers don't like an audience." Pettypiece said the society is still working out its next step, but public education is expected to be a focus going forward. Building 15.5 kms of the Trans Canada Trail from Lacombe to Ponoka County border won't go ahead any time soon after Lacombe County hit a roadblock trying to buy land from landowners. Lacombe County Manager of Operations Phil Lodermeir told council at its regular meeting Aug. 25, that local landowners refused to sell the right-of-way to make way for the trail along the C & E Trail. "We really want to get this trail built but we're not having success getting land owners to sell us land." The county could change the original route for the trail but it would increase the original $909,734 price tag to $2.1 million. The county received three grants totalling $695,000 and will lose the grants. Coun. Dana Kreil asked if the money could be used in other areas for trails around the county. "If the money is available I hate to send it back." Lodermeir pointed out, however, that if the county spends the money they have to match the funds. "This will free up money in tough times," said Coun. Kreil. Coun. Brenda Knight said she was in favour of cancelling the trail project. "We are in a bit of a need versus want situation in Alberta. Grants cost money and sometimes gifts cost you more than what you got for the gift. The trail is a wonderful amenity. There is always the future." Reeve Paula Law said the entire trail didn't have to be paved and the county should proceed. "We will lose $700,000 (grant). I struggle with closing the door. Nothing says it (trail) has to be paved." Council voted in favour of administration's recommendation to remove the trail project from the 2016 construction schedule. Reeve Law voted against the motion. Landowner opposition has shut down a Lacombe County plan to build a 15-km trail. Creating the link from Lacombe to Hwy 604 just west of Hwy 2 needed four or five landowners to sell a five-metre strip of their property to the county. But only one was willing to do that, said Phil Lodermeier, county manager of operations. Widening C&E Trail to create space for pedestrians and cyclists was considered as an alternative but costs would have soared to an estimated $2.1 million from the previous $1.1-million cost estimate. Not widening C&E Trail, but designating the road as a pedestrian and cycling trail was also considered. However, mixing traffic and walkers is potentially dangerous and could open up the county to liability. Given the challenges, council voted to cancel the project last Thursday. "There was quite a bit of disappointment," said Lodermeier. The project had been given a big boost earlier in the year when the county was successful in three separate grant applications totally $695,000. Two major obstacles -- obtaining necessary permission from Burman University and Alberta Transportation -- had also been overcome. Lodermeier said convincing landowners to sell some of their land proved an insurmountable problem. "It was funny because they all seemed to think a trail was a really good idea," he said. "But when it came right down to selling us some land they all (but one) said no." Concerns ranged from littering and loose pets bothering livestock to fears the trail could provide thieves more opportunities. Lodermeier believes privacy was the biggest issue for many landowners. "I do think it just comes down to that privacy issue and 'we just don't want people going by our place.'" Time was an issue as well. The grants were tied to Canada's 150th anniversary celebrations and trails were to be completed by next year, a deadline that was becoming less likely to be met. Work continues this summer on a multi-use asphalt trail and green belt to run along what will become 20th Avenue, part of a future ring road around Red Deer. Wayne Gustafson, engineering services manager with the city, said the $4.5-million project, that runs 4.8 km from 55th Street to 19th Street, is in preparation for 20th Avenue that is scheduled for construction sometime between 2017 and 2025. "We hope to have all of the trail done this year right through to 19th Street," Gastafson said on Monday. "The trail sometimes jumps up on top of the berm. We're meandering that trail to take advantage of the various green spaces." The trail will connect to trails at Ross Street, 32nd Street, and the existing trail along 19th Street, east of 30th Avenue. Construction of the trail and green belt began last August and Gustafson said parts of the trail are already being used by runners, walkers and cyclists. "It helps create a bigger loop in that southeast area as part of the trail network. At the same time, it's getting a jump on providing a bit of a buffer for the future construction of 20th Avenue." The green belt includes a vegetative retaining wall made of stacked bags filled with soil that varies in height depending on the elevation of the future roadway. The wall will be sprayed with a grass seed mixture which will grow on the wall. "It's a bit of a pilot project that we're utilizing to green up the retaining wall a little bit so it's not just a concrete block wall. It will allow for the planting of trees and shrubs and grasses and various plantings inside the wall." He said the vegetative wall is more cost effective in terms of up-front capital costs, provides a better visual, and fits well with the city's environmental initiatives. The ring road, called the North Highway Connector Project, will be part of an expressway that will align Hwy 11A, Northland Drive, 20th Avenue and McKenzie Road when completed to reduce congestion on city arterial roads and improve traffic movement. Ponoka, Lacombe, Blackfalds, Red Deer: these are the spine of a trail that will eventually connect Calgary & Edmonton. The present trail is wonderful to explore. Plan your trip around the Ponoka Stampede in early July and be sure to catch the kick-off parade. We set up chairs early, and then cycled from one end of Ponoka to the other along the Battle River. We couldn't find a route south (except for the JJ Collette Walking Trails) so we packed up and drove to Lacombe. There we had better luck. Starting at the Lacombe Research Station, we glided over paved cycling trails all the way to Blackfalds, enjoying the wide open spaces as we went. The Lacombe Marsh complete with interpretive panels was a pleasant stop halfway along. Blackfalds is so proud to be on the TCT that they built it into their community leisure centre -- yes, they have brought the TCT indoors making it as part of their running track. Following thru the town we came to a welcome pedestrian bridge over the Blindman River. This connects Red Deer to Blackfalds on a 'semi-quiet' country road. The paved trails of Lacombe County seemed all the more significant as we watched for cars and trucks passing. Lacombe County has set an excellent standard for rural trails in Alberta. Once in Red Deer, a cyclist is home-free to enjoy a trails-eye view of this beautiful city on the Red Deer River. One small section of TCT south of Red Deer lies in the village of Springbrook near Penhold. On display is a vintage Harvard aircraft, as bright as the surrounding canola fields. Both were highlighted against brilliant Alberta blue skies. Central Albertans have another walking trail to take in the sights and sounds of nature. NOVA Chemicals Community Nature Trail, located north of NOVA Chemicals on Hwy 815, is five km of looped trails with a picnic area, small bridge crossings, benches, viewpoints and interpretive signage. The trail opened last fall, but final touches were completed this spring. "We're getting a lot of positive feedback. It's spreading by word of mouth," said Rick Van Hemmen, site leader for Joffre. "It's very well constructed and will be a lasting legacy for the area. It really does a great job in showing what we believed all along, that you can have industry living in harmony with wildlife habitat, agriculture, recreational land uses, all at the same (time)." NOVA Chemicals Corp. is a Calgary-based company that operates ethylene and polyethylene plants at Joffre. The 220-acre trail area has never been tilled for farming and vegetation includes native grasses, willow, poplar and aspen stands. Wetlands on site have natural drainage channels to Jones Creek. "It's not often that you get to have a trail through what is such a good natural wetland area that's already pretty ripe with a variety of vegetation and wildlife that you can see on the trails." Van Hemmen said Nova has planted more than 9,000 seedlings to enhance the natural ecosystem. Seedlings were planted to make up for trees that were removed for rail yard expansion at Joffre, but many more trees were planted than were lost. The trail project was first announced in 2013 to mark a significant growth milestone for NOVA Chemicals -- its Polyethylene 1 Expansion Project at the Joffre site. The $1-billion project will allow NOVA to increase its polyethylene output by a billion pounds per year. He said project construction is about 90 to 95 per cent complete and is expected to be mechanically complete before the end of summer. Production is anticipated to start before the end of the year. Polyethylene is used to make products ranging from plastic bottle caps and toys to food packaging and bags. The trail, that takes about an hour to walk, is open to the public from sunrise to dusk. All recreational users must sign in before using the trail and sign out before leaving. A box to the right of the entrance sign contains the registry. For the safety of users and to preserve the natural landscape, people must stay on the trails, keep dogs on leashes and pick up after their dogs (bags are provided), and carry out their garbage. Fires camping and hunting are not allowed and neither is picking flowers or feeding wildlife. Industry in the area regularly tests safety sirens. Trail users should call NOVA Chemicals if they hear an alarm or siren. Parking at the trail can be accessed off Township Road 39-0. Red Deer County councillors have been given an update on a proposed recreational trail north of Springbrook along Rge. Rd. 280 to Twp. Rd. 381. The move came during the recent regularly scheduled council meeting. On June 7 councillors deferred a decision on approving the project pending further consultation as to the standard of the trail and for further information regarding possible donors. "Following a more detailed review, the estimate now provided for a semi-developed (gravel) trail is $2,152,323 and for a developed (paved) trail is $3,047,481," county manager Curtis Herzberg said in a briefing note to council. "This includes estimated costs of land acquisition, design and engineering, trail amenities, supporting infrastructure such as culverts, pavement and a 20 per cent contingency." The Springbrook to Red Deer Trail would be considered a regional trail that would link the two communities together and will have both a recreational and active transportation perspective, he said. "The trail will be non-motorized with multi-use including pedestrians, cyclists, and small wheel users, cross country skiing and snowshoeing. Due to its higher level of use and development, it is recommended the trail have an asphalt surface." An application was previously submitted to Trans Canada Trail and the Alberta TrailNet Society regarding the project. "Both organizations have approved a financial contribution to pay up to 50 per cent of construction costs to a maximum amount of $1.5 million in support of the trail project," he said. "Funding conditions for the grant include that the project must be completed by 2017, funding must be matched by 50 per cent, and that the county is to cover the detailed design and engineering costs." - Not proceed with the construction of the regional trail between Springbrook and Red Deer along Rge. Rd. 280 and Twp. Rd. 381 at this time and deny the request to provide funding to match Trans Canada Trail and Alberta TrailNet funding in the amount of $1,500,000. Further to that, both Trans Canada Trail and Alberta TrailNet will be advised that the project will not be proceeding and grant funding already received from Trans Canada Trail will be returned. - Consider a new level of service by providing for trail development, operation and maintenance and agree to construct a regional trail between Springbrook and Red Deer along Rge. Rd. 280 and Twp. Rd. 381; agree to provide funding to match Trans Canada Trail and Alberta TrailNet funding in the amount of 50 per cent ($1,500,000) to develop this regional trail with funds to come from the community services reserve account and to amend the 2016 budget accordingly. During the July 5 council meeting, councillors opted for the first option, denying the project. Meanwhile, councillors have approved the construction of a playground and basketball court off Redwood Boulevard in Springbrook. "The intent of the project is to create a public space that provides a variety of physical activity opportunities to the residents and their families, as well as visitors, to the community and Springbrook and the Malibu communities subdivision," county manager Curtis Herzberg said in a briefing note to council. "The new project includes the construction of a playground consisting of one playground circuit for children up to five years of age and one for children 5-11. "The project also includes a basketball court and the addition of a garbage/recycling bin, a picnic table and bench." The land for the playground will be provided by the developer. Seven bids for the project were received, ranging from $125,000 to $225,000. Those bids were subsequently analyzed by the planning department, which recommended the $169,307.75 bid from BDI Play Designs be accepted ($177,774 with contingency). Council approved the project budget of $177,774 for the construction of the playground and basketball court to be funded from municipal reserves. In other news, council approved a chart setting out strategic priorities for the municipality going forward. The move came during the recent regularly scheduled council meeting. "The priorities were determined by council and senior management working in collaboration with the process being facilitated by Dr. Gordon McIntosh of the LGL Institute," county manager Curtis Herzberg said in a briefing note to council. Council's top strategies identified are the development and/or review of a growth readiness strategy, third party funding policy, transportation action plan, community needs assessment and a growth strategy for Penhold. Items included as next on the list include procedure bylaw, public hearing process, residential development consultation, economic development action plan, and agriculture viability strategy review. Local cyclists have vowed to take another shot at getting Red Deer County's help with a bike trail between Springbrook and Red Deer. During its regular meeting on Tuesday, county council turned down a request to build and maintain an 11-kilometre multi-use trail that would become part of the Trans Canada Trail system. The mayor and council decided they could not move ahead with the project without assurances of public support and a firm commitment from other donors. Mayor Jim Wood and various councillors involved in the discussion said that, while they support the proposal in principle, they have not had feedback from their ratepayers and therefore don't have any way of guaging public response to the project. A community needs assessment is planned this fall, but it would not be completed in time to proceed with the project and still meet Trans Canada Trail's deadline, said staff attending the meeting. Community services staff had estimated that it would cost between $2.2 million and $3.04 million to buy the land and build the trail, with annual maintenance costs ranging from $55,000 to $77,000. Trans Canada Trail Foundation has committed to covering half of the capital costs, to a maximum of $1.5 million, providing the trail can be ready to use by September 30, 2017 -- in time for Canada's 150th anniversary celebrations. About a dozen local cyclists attended the meeting, including one who was happy to see the proposal turned down. Brenda Carratt said she views the project as a long-term burden on taxpayers during tough economic times. "It's a pit that's never going to end," said Carratt. "Probably there will be another region that can use that $1.5 million. I don't think we're the ones that need it at this time. It's tough times out there." Virginia Holt, who lived in Springbrook when it was still known as Mynarski Park, said local cyclists have been trying for decades to get a trail built from there to Red Deer. "For 30 years we've been waiting for the Trans Canada Trail," said Holt. "How long do we wait? Lots of people bike on that road, you know, and it's very dangerous." But Carratt said she would not feel safe biking on that trail, or any other for that matter. "I'm not going to (bike) down some country road with my daughter and you don't know who's on that trail," she said. Paul Pettypiece, president of Central Alberta Regional Trails Society, said he was "somewhat surprised" that council chose to deny the project and believes members may have felt backed into a corner to some extent. "I believe, personally, that (the deadline) could still be met that if there was enough support that came forward in the meantime, say in the next 30 days," said Pettypiece. His group plans to meet with other organizations to see if some firm commitments can be made and brought back to the county to help build the trail and look after its maintenance. "I think we would need to have a tremendous amount of community engagement, and it might include a petition or something of a similar nature, so that the county realizes that there is a tremendous amount of support for this trail," said Pettypiece. Webmaster notes: Council voted 4-3 against deferring a decision and against proceeding with the trail. Mayor Jim Wood and councillors Christine Moore and Jean Bota voted to proceed. Many residents of the hamlet of Springbrook have supported being part of the Trans Canada Trail since 1998. Building the Trans Canada Trail in Central Alberta has had many successes in recent years as well as many challenges. Several communities north of Red Deer are now or about to be connected to the largest recreational trail in the world, a legacy project that will be connect Canadian communities from coast-to-coast-to-coast. It is currently 86 per cent complete nationally and most of the trail will be on the ground by the fall of 2017 to celebrate Canada's 150th birthday. Communities south of the city are eager to get connected. Red Deer County is considering the 11-km section from Red Deer to Springbrook as the next connection to be made. Although rural municipalities have special understandable challenges and concerns, there are many benefits to rural residents. Springbrook is a young, vibrant, active and mobile community of about 1,200 p;eople that already heavily uses the existing trails. There is no doubt that linking those users to a wider network will reap huge benefits to the health, well-being and quality of life to that community. Rural trails across Canada, including the Blackfalds-Lacombe trail, have demonstrated that the benefits far outweigh the challenges and perceived concerns. - Trails are a safe alternative for active transportation that avoids the dangerous walk or bike along a busy high-speed highway or other roadway. -Trails provide an affordable recreational means of improving health and wellness for all age groups. - Trails encourage a sense of community and place by engaging with one another and by sharing and exploring their environment. - Trails improve the quality of life of residents by providing leisurely access to nature and heritage. - Trails encourage tourism and economic development as local businesses serve trail users. - And rural trails assist urban and semi-urban people to gain an appreciation of the rural and agricultural lifestyle. Red Deer County has a huge opportunity to get a significant amount of trail built at a bargain price. The Trans Canada Trail Foundation and Alberta TrailNet have approved 50 per cent funding to the county to a maximum of $1.5 million. This funding, along with other financial or in-kind donations could be leveraged so that the actual cost to the county is relatively low. County Council will be making a decision on the morning of Tuesday, July 5 on whether or not to proceed. Support from county residents will go a long way in assuring that this legacy amenity for present and future generations will go ahead. Potential trail users, especially those living in the county, need to be at that council meeting to show their support for this vital link. The future of the Central Alberta section of the Trans Canada Trail is up for debate at Red Deer County Council on Tuesday. For some years, members of the Central Alberta Regional Trails Society have been working on a project that would see construction of a trail between Bowden and Ponoka. The new trail, now partially complete, will be part of the Trans Canada Trail Network, which organizers plan to finish in time for Canada's 150th anniversary in 2017." The section from the south side of Red Deer through Blackfalds to Lacombe is now complete, including construction four years ago of a bridge over the Blindman River, CARTS president Paul Pettypiece said on Thursday. However, all that exists south of Red Deer is a one-kilometre section between Springbrook and Penhold, he said. The county has already received a portion of the grant promised by Trans Canada Trails toward building an 11-km section from the south side of the city to Springbrook, running along Range Road 280. However, the county is now weighing its options and considering whether or not it should proceed with the project. A report to council prepared by community services manager Jo-Ann Symington estimates the total cost of construction at $2.15 million for gravel or $3.04 million for pavement with annual maintenance estimated at $55,000 to $77,000. Trans Canada Trail and the Alberta TrailNet Society are to provide half of the construction costs to a maximum of $1.5 million and there may be some additional funding to come from another source, Symington says in her report. However, the county has not received that commitment, she says. She offers council two options: Consider offering a new level of service and moving ahead with the project or not proceeding with the project and returning funds that have been granted so far by Trans Canada Trail and Alberta TrailNet. Pettypiece said county council has been reluctant to take on the role of building and maintaining the trail. In a letter to council, he expressed concern that monies promised by Trans Canada and Alberta TrailNet will be diverted to other projects if the county decides against building the Springbrook section in time for the 2017 deadline. In a letter to the county's mayor and council, Pettypiece expressed concern for the safety of people who bike along Hwy 2A. "Based on experience elsewhere, we are very confident that there are a lot more people who would bike to and from Red Deer and Penhold if there was a safe alternative to the highway," he wrote. Roadways will be used as temporary links for those portions of the Trans Canada Trail that have not been finished by the fall of 2017, he said. The ambitious project to upgrade the nature trail at Napoleon Lake is continuing this spring and could be completed in 2016, a year earlier than planned. Last summer, members of the Rotary Club of Innisfail finished construction of two viewing platforms with boardwalks at the north and south sides of the lake. That part of the project was followed in the fall with the town creating a graded path from the nature trail to the viewing platforms. The project than moved forward last month with the town hiring a contractor to flatten and smooth out the kilometre and a half long nature trail from the south viewing deck to an area near the off-leash dog park at the north end of the lake. That work was completed in two days. "It will get rid of some of the bumps and hopefully remove some of the tree roots, smooth them out so there are no tripping hazards," said Henry Wong, the town's director of community services, who added the grooming will also blend in the old "goat" trail that goes through portions of the main trail. "With the trail being smoothed out a little bit it will make it easier for not only hikers but also for people who want to cycle down that trail. It is not going to be smooth like your paved trails but it will be smoother than what it used to be." Wong said the cost to the town for the contractor was about $4,000. The project, which had an estimated original timeline of three years with a total budget of $(2,000, is a partnership between the town and Rotary, with the service club paying for two-thirds of the cost and the town picking up the rest. Wong said the town will be installing garbage receptacles and up to five benches along the nature trail, with one bench going on each of the new platforms. As well, part of the upgrades at Napoleon Lake will include a 139-metre paved connector path that runs from the west end of 47 Street, just past the north end of the lake to near the south viewing deck. Council approved the cost and tendering contract for that work, part of an overall paving package for several projects in town, on June 13. The town and Rotary are also in discussions for new interpretive signage at the lake. Wong said the number of signs to be installed has not yet been decided but added some will "probably" be put on the viewing decks to recognize the efforts of the Rotary club. Others will be put up to mark points of interest and information on natural vegetation in the area, with detailed content to be decided later. Monty Wild, Rotary member and key project organizer, said members from the service group's Local Projects Committee are expected to meet with Wong this summer to discuss the placement and types of new signage at Napoleon Lake. In the meantime, Rotary members have already received positive public feedback about the improvements that have already been completed, said Wild. "Many of the Rotary members who use the park and trail have heard comments from a number of people who use the trail now as opposed to before, and we have heard nothing but positive comments," said Wild. Red Deer County has a little more leg work to do before deciding how best to proceed on a proposed Springbrook-to-Red Deer trail. Grant funding is available to cover up to half the cost - to a maximum of $1.5 million - of the eight-km route. At least one private donor has also expressed interest in helping bankroll the project. The cost of the trail, which would become part of the Trans Canada Trail, is estimated at $2.4 to $3.2 million. A report to county council on Tuesday recommended that up to $1.5 million be taken from reserves to go towards the trail that would run north of Springbrook on Range Road 280 and connect to Township Road 381 and the city's 32nd Street. The amount required would depend on project cost and private donations available. Mayor Jim Wood voted with council to defer a decision for a month to work with the interested donor and review its options. "Council has chosen today to further negotiate with the donor at this time," said Wood. "I think we all want to get more information on where we're at." In the next month, the county will also see if there are other donors willing to step up. "There could be people who would like to, potentially put money towards something and maybe (provide) a legacy." Wood said private help would be welcomed, especially at a time when municipalities are managing their budgets carefully. Whether to go with a gravel or asphalt trail must also be decided. "The cost can, in fact, be hugely different," he said, adding council doesn't have detailed numbers yet. There is pressure on the county to make a decision soon because under the Trans Canada Trail and Alberta TrailNet grant programs, the trail must be done by the end of September 2017. Besides lining up all the necessary funding, land acquisition, design, engineering and tendering must be taken care of before the first shovel hits the ground. The trail issue will come back to council for its July 5 meeting. On Saturday, May 28, Phil Lodermeier received the highest recognition bestowed by Alberta's provincial trails organization. The Trail Blazer award from Alberta TrailNet Society recognizes and individual, organization or entity that has made significant contributions to, and demonstrated longstanding commitment and involvement in trail planning and development in Alberta. "It's like the Stanley Cup of Trails," said Betty Anne Graves, Calgary-based board member and vice-president of communications for Alberta TrailNet. "In selecting the recipient, Alberta TrailNet recognizes that Trail Blazer accomplishments often reflect the contributions and commitment of staff, elected representatives, community trail builders, stakeholders and volunteers within that community." Lodermeier received the award in recognition of his efforts and involvement in building the Trans Canada Trail within Lacombe County. Lacombe County completed a beautiful section of trail from Lacombe to Blackfalds and from Blackfalds to the edge of Red Deer (County) in 2013. They are currently working on a new trail north of Lacombe to connect with the Bluebird Trail in Ponoka County. "Phil Lodermeier's passion and enthusiasm has been a catalyst in the development of trails within Lacombe County," said Reeve of Lacombe County, Paula Law. "The leg of the Trans Canada Trail between Blackfalds and Lacombe is a shining example of Phil's vision for designing and constructing trails. We are eagerly waiting to see what he has in mind for the section between Lacombe and Ponoka County to complete the County's portion of the TCT." Lodermeier was presented the award in a private ceremony on May 30. County staff members Bill Cade, Dale Kary and Brandon Maier were also recognized with Trans Canada Trail walking sticks for their trail building efforts. "Even though it is a great honor to be selected for this award, the truth of the matter is that from start to finish the trail program has many champions in Lacombe County," said Lodermeier. "The trail would not have been possible without the support of County Council and their authorization of the time and funding towards the program. Lacombe County staff has embraced the challenges of designing, negotiating for land, building and maintaining trails and I am pleased to share this award with Bill Cade, Dale Kary, Brandon Maier, County Council and all of the Lacombe County staff." 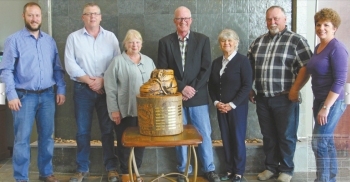 The award, created by sculptor Rick Silas, is a beautiful large hand-carved wooden hiking boot on a tree stump that features the names of the award winners engraved on brass plaques. It will be on display at the Lacombe County offices for the next 12 months. Each award recipient also receives a unique hand-carved wooden replica of the larger Trail Blazer Award mad the sculptor Ilb Rasmussen. Photo supplied - Brandon Maier (Assistant Public Works Supervisor, Lacombe County), Bill Cade (Public Works Supervisor, Lacombe County), Linda Strong-Watson (Executive Director, Alberta TrailNet Society), Phil Lodermeier (Manager of Operations, Lacombe County), Betty Anne Graves (Vice-President of Communications, Alberta TrailNet Society), Dale Kary (Maintenance Foreman, Lacombe County), Debbie Olsen (Director, Alberta TrailNet Society). A Lacombe County manager has been recognized for his trail-building efforts. Phil Lodermeier, the county's operations manager, was named 2016 Trail Blazer by the Alberta TrailNet Society. "It's like the Stanley Cup of Trails," says Betty Anne Graves, TrailNet's vice-president of communications in a statement. Lodermeier was presented with the award at a ceremony in Cochrane on Saturday. Lodermeier was singled out for his work overseeing the TransCanada Trail link from Red Deer to Blackfalds and the ongoing work to connect it to the Bluebird Trail in Ponoka County. Lodermeier said he shared the award with other county staff and council members, who have all supported the trail-building initiative. This year, Lacombe County building a 15.5 km stretch of trail from the City of Lacombe to the Ponoka County border. Lacombe will build a 1.9-km link connecting to its trail system. Webmaster note: Phil has overseen the TCT link from Blindman River to Blackfalds and from Blackfalds to the City of Lacombe. Central Alberta's trail system will get a nice boost this summer. Lacombe County is planning to begin building a 15.5-km stretch of trail from the City of Lacombe to the Ponoka County border. Lacombe will build a 1.9-km link connecting to its trail system. Lacombe County council got some good news on the trail-building front. The county went three-for-three on grant applications to the TransCanada Trail, Alberta TrailNet and the province's Alberta Community Partnership program. In all, $800,000 in grants were lined up. The county must match the $450,000 raised from the two trail group grants, which will almost cover the projected $910,000 cost of building the 15.5 kms. The remaining $350,000 will be split 70/30 with the City of Lacombe, leaving the county $245,000 to work with. On Thursday, council voted to use the extra cash to begin paving a portion of its trail. About three kms can be paved this year. I would like to congratulate the Alberta NDP government of Premier Rachel Notley and Minister Brian Mason and the staff of Alberta Infrastructure, Mayor Tara Veer, council, and staff of the City of Red Deer and Mayor Jim Wood and council and staff of the County of Red Deer for the recent decision to improve interchanges and access along Highway 2. This will alleviate a long-standing issue of safe access along this busy stretch of highway, as Red Deerians and residents of the County of Red Deer will know. With the redevelopment of Gasoline Alley as a residential hub as well as a thriving business community, this will enhance the shared connections between the city and county to the benefit of both, in addition to the safety of those just passing through. It will be ready for the Canada Winter Games which will showcase Red Deer and area to the rest of Canada. I would also like to thank the efforts of Central Alberta Regional Trails Society which are the leading proponent for a connected recreational trail system. Recent successes of this group include the construction of the Trans Canada Trail from Blackfalds to Lacombe. CARTS is also working with the County of Red Deer to develop the regional trail system from Penhold to Springbrook subsequently connecting to Gasoline Alley and the City of Red Deer. Currently, there is no pedestrian access to Gasoline Alley. As part of the infrastructure improvements to be made to the Highway 2 interchanges and collector roads, pedestrians, cyclists, and other active commuters will be accommodated via a path along Taylor Drive, under Highway 2. The connecting trail systems are under the jurisdiction of the City of Red Deer and Red Deer County. Including an option for active travel for those who choose or by necessity walk, run, bike, rollerblade, or long-board as part of their daily commute or recreational activity can only benefit health and safety for vulnerable road users, the environment, and also for us drivers in reducing congestion and improving accessibility. Society as a whole benefits. Established in 1988, the Canadian Northern (Meeting Creek) Historical Society, in conjunction with several partners, is playing an active role in the development of an extensive Linear Park system in East Central Alberta. Seven sections of Natural Linear Park, located on abandoned rail bed owned by the East Central Alberta Heritage Society, have already been created. The four kilometre sections total approximately 25 kilometres out of more than 114 kilometres of available right of way between Edberg and Rumsey, AB. Located in natural virgin territory, the trails are ecologically important. They help to preserve wetlands and provide the treed corridors required by a variety of migrating bird species, while creating excellent opportunities for people to connect with nature. The parks are fenced and gated. There are no road crossings, industrial activity or heavy equipment usage on the trails. Public access is by foot only, and no motorized vehicles of any kind are allowed. It is hoped that a Natural Linear Park encompassing the entire 114 kilometres of right of way can eventually be created. Phase I of the Canadian Northern Society's participation in the ongoing development of the Linear Park system involved the enhancement and promotion of the existing trail system between Edberg and the Meeting Creek Railway station. Phase II of the Society's participation is underway and involves developing a two kilometre interpretive trail through the seven hectares of land owned by the society. This will extend the existing trail east to Highway 56. The trail development will include the building of fences and access gates on the abandoned railway line east of the Meeting Creek Railway Station and Elevator. It also involves the restoration of an eight hectare prairie grassland area using organic methodologies that are unique, align with the natural characteristics of the area and can serve as a model for others to follow. The Linear Park trails contain virgin soils and an abundance of diverse flora and fauna. The society has developed discovery kits that can be used on self or guided tours of the existing Linear Trail directly east of Meeting Creek. These kits contain information about the many birds, insects and plants along the trail. On these tours, individuals may see a wealth of different flowers that bloom throughout the season, as well as blue birds, cedar waxwings, rarely seen meadow larks, red tailed hawks, ducks and a variety of sparrows. The discovery kits also include a brief history of the railway line that once occupied the trail. The Canadian Northern Society has a vision for the maintenance and development of the property at Meeting Creek that is holistic and includes several dimensions. The existing historic 1913 railway station and 1930 elevator that have been restored by the society are already being used to engage and stimulate inter-generational involvement and interest in prairie and railway history. The grassland restoration and trail development project opens up access to an ecosystem that is beautiful, diverse and relatively untouched. Once completed, it will add the dimension of eco-centre to the property by preserving important habitat and biodiversity. The entire linear park system and the project at Meeting Creek will be used as an example to educate the public about how an ecological system works and how the watershed impacts their own daily lives. It will demonstrate the effectiveness of a restoration process that does not require the use of toxic herbicides or artificial fertilizers that pollute our water systems. The trail system will be used by locals and visitors. Its use will help to connect people to their place in nature, promote healthy lifestyle activities, teach the history of the area, and illustrate the value of ecology and the need for conservation. Educating the public about benefits of the project to the Meeting Creek community should result in community pride. Education about organic techniques will also encourage the further development of , and advocacy for, organic practices that save our water supplies and environment. Events such as guided at the yearly ball tournament, Prairie Fun Days and booked bus tours will result in an increase in tourism, with commercial opportunities for people in the community such as supplying lunch, meals and sale of local products. Based upon the Grade 4/5 environmental curriculum, the society also plans to offer a yearly Celebrate the Earth Day at Meeting Creek for school children. The first of these will be held on June 15 of this year and include elements related to the rich aboriginal history of the area. (The society is) currently taking bookings for this event. All Battle River School Division Schools are welcome to register.